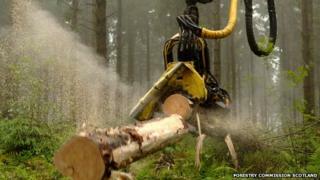 A major study is being launched to gauge the contribution of forestry to the Scottish economy. The study, which is being conducted on behalf of Forestry Commission Scotland, will look at the economic contribution of the sector - including forest-based tourism. It will also look at the contribution of non-forestry activities, such as renewables and agriculture. Businesses in the sector are being urged to take part in a survey. Scotland's environment minister Paul Wheelhouse said: "These are important economic indicators for the Scottish government's Forestry Strategy and help to inform debate around forestry policy. "The last assessment was carried out six years ago and much in the world of forestry has changed since then. "It is vital that businesses working in the forest industries complete the questionnaire to produce credible, up-to-date figures that demonstrate the economic value of the industry and employment supported. "The study will also look at the economic contribution of the National Forest Estate, managed by Forestry Commission Scotland, which in itself will be an important piece of work to inform policy." CJC Consulting has been commissioned to undertake the study on behalf of Forestry Commission Scotland, in conjunction with Confor, the UK Forest Products Association, Scottish Enterprise and Scottish Land and Estates. Video Could Scotland run out of wood?